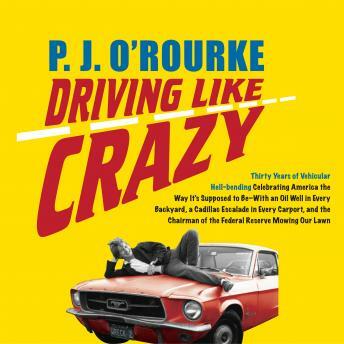 A New York Times bestselling author and America's preeminent political satirist, P. J. O'Rourke also has another side to him-a gear-loose gearhead, automotive devotee, and terrifying driver. Son and grandson of car dealers in Ohio, P.J. 's family has been in the motor vehicle business since before there were motors in vehicles. And P.J. has been writing about cars-for Car and Driver, Automobile, Esquire, Forbes, and other publications-for what seems like almost as long. In this newly collected anthology of spiels-on-wheels, O'Rourke celebrates cars and berates car haters, and chronicles America's relationship with automobiles from love for a powerful chariot of freedom to tolerance of an oversized household appliance with an extra-long extension cord. Driving Like Crazy brings together thirty-some years of journalistic cornering on two wheels, including the classic "How to Drive Fast on Drugs While Getting Your Wing-Wang Squeezed and Not Spill Your Drink." And he's written an appendix to that piece of sage advice for those who, like himself, are thirty years older now: "How to Do Ditto While the Drugs Are Mostly Lipitor."